George Drinkwater was born in Banbury on 9 September 1808. He appears to be the son of John Drinkwater, an innkeeper and later a coachmaster of Neithrop, and Ann Wise, who were married at Banbury on 15 July 1796; but although they had seven children baptised at Banbury Church between 1797 and 1810, George was not included. Eliza Sanderson was born in Coventry in 1814/15. 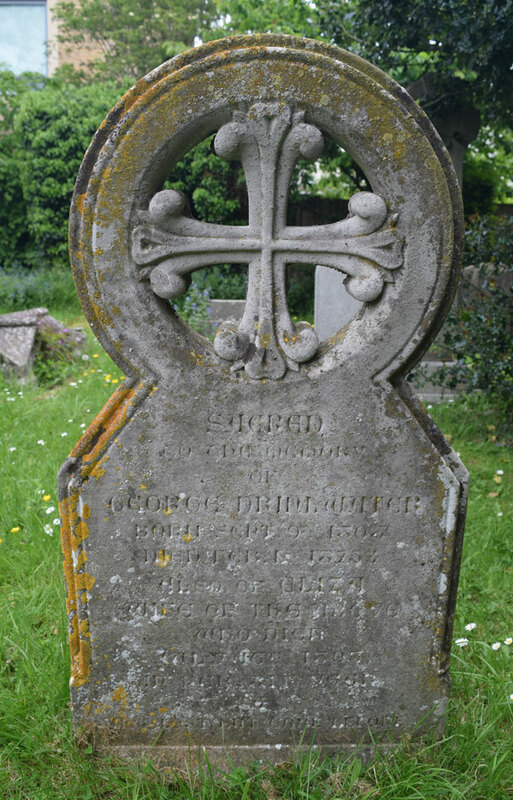 George Drinkwater (born at 22 Gloucester Place, Cheltenham in 1840 and baptised there on 15 July; died aged one and buried in the New Burial Ground, Cheltenham on 24 December 1841. George and Eliza Drinkwater were still living in Cheltenham when their son George was born 1840. At the time of the 1841 census they were staying at Walton Place in Oxford with George (1) in the home of Sarah Drinkwater, who was aged about 55 and was almost certainly a relation. This was probably just a visit, as they were back in Cheltenham in December that year when their son George died. They had moved to Warwick by 1842. At the time of the 1851 census they were living at West Street in Warwick, where George was working as a coachman, with their children Caroline, Harry, and Mary, and one servant. In September 1854 he was appointed on to the committee of taking steps to protect the interest of the trade of licensed victuallers “against the injuries inflicted on that class by the recent legislative measures”, namely the new Beer Act. By October 1857 George Drinkwater was a Churchwarden of St Michael’s Church. At the time of the 1861 census George Drinkwater (52) was living at the George Hotel with his wife Eliza (46) and his four surviving children Caroline (18); Harry (17), who was an articled clerk to an architect; and Mary Ann (15) and Albert (9) who were at school. They employed a cook, barmaid, waitress, chambermaid, ostler, and boots who all lived on the premises, but their guests comprised just three commercial travellers. 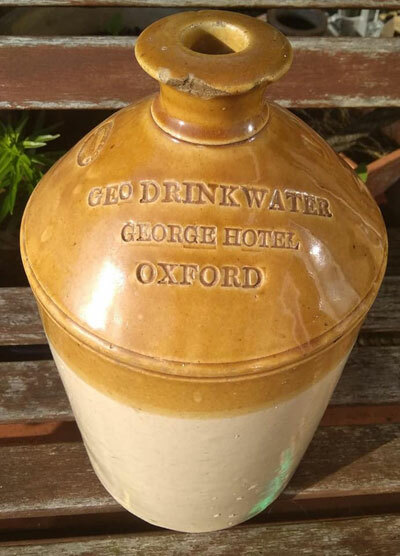 The flagon on the right bears the name of George Drinkwater and the George Hotel, Oxford. James Champion (39), a gentleman of Piccadilly. At the time of the 1871 census George and Eliza Drinkwater were still running the George Inn, but of their four children only one, Mary Ann (24), was at home. Harry (27) was lodging in Marylebone and working as an architect, and Albert (19) was paying a visit to his married sister Caroline in Hampstead. Their son Albert Edwin Drinkwater was matriculated at the University of Oxford from Merton College on 25 November 1871 at the age of 19. He became a member of the Glow-worms amateur theatrical group, and in January 1872 he played the principal character in The Steeple Chase at the New Theatre. † George Drinkwater died at “The George” in Cornmarket Street at the age of 64 on 1 February 1873 and was buried at St Sepulchre’s Cemetery on 6 February (burial recorded in the parish register of St Michael’s Church). His death notice in Jackson’s Oxford Journal read: “Feb. 1, at Oxford, after a long and painful illness, Mr. George Drinkwater, in his 65th year.” His effects came to nearly £2,000. On 16 August 1877 at Ss Philip & James’s Church Albert Edwin Drinkwater married Annie Beck Brown of Winchester Road, the daughter of an ironmonger. He was then described as a tutor of Leckford Road. On 11 July 1878 at St Mark’s, London Harry George Walter Drinkwater married Rose Carr. By the time of the 1881 census his widow Eliza (68) had moved to 7 Warnborough Road, where she lived with her unmarried daughter Mary Ann (35) and one servant. By 1891 she had moved in with her son Harry and his family at 1 Farndon Road, and then appears to have moved with her daughter Mary Ann to Leamington Spa. † Mrs Eliza Drinkwater née Sanderson died at Leamington Spa at the age of 81 on 16 July 1893 and was buried at St Sepulchre’s Cemetery on 19 July (burial recorded in the parish register of St Michael’s Church). Her effects came to £152 2s. 10d., and her executors were her two sons Harry, who was now an architect, and Albert, described simply as an Esquire. † Miss Mary Ann Drinkwater died 175 Rugby Road in Leamington Spa at the age of 64 on 31 December 1910 (according to the grave inscription, but was also buried at St Sepulchre’s Cemetery on 31 December (according to the burial register of St Michael’s Church). One of these two dates is a few days wrong. She was buried in her parents’ grave in Oxford, and an inscription to her was added on the back of the headstone. Caroline Louisa Drinkwater, Mrs Champion (born 1842) was living in Hampstead in 1871 with her husband James Champion, who was a clerk in the London & Westminster Bank, and their children George (4), Isabella (3), and Florence Mary (1). They had seven more children: Percy Arthur, Ada Marie, Clara Elise, Alfred Ernest, Ethel Mance, Constance, and Mabel. By 1901 Caroline was a widow, living in Streatham. In 1911 she was aged 68 and living at 97 Drakefield Road, Tooting with her three unmarried daughters: Florence (41) and Ethel (32) were morning governesses, and Mabel (27) was an assistant manageress in a steam laundry. Caroline died in the Wandsworth district at the age of 80 in 1923. Albert Edwin Drinkwater (born 1851/2) was initially a schoolmaster after gaining his degree. It was announced in Jackson’s Oxford Journal that his wife Annie had given birth to a stillborn son at Chardstock in Devon on 8 September 1878. In 1881 he was still working as a schoolmaster and living with his wife in Essex at Dorset Villa, Fairlop Road, Low Leyton. His only son John Drinkwater (who was to became a famous poet and playwright) was born in 1882. By 1891 Albert was working as an actor and living at 1 Ladbroke Crescent, Kensington with his wife Annie and son John (8); and he also wrote plays and poems. Annie died in 1896, and In 1898 in Kensington he married his second wife, Lilian May Revell, who was 16 years his junior. In 1911 they were living at 1 Ladbroke Crescent and both working as actors. Albert died at 3 St Stephen's Square, Bayswater at the age of 71 on 27 January 1923. His effects came to £4,604 17s. 9d., and his executors were his wife Lilian and son John, described as an author.